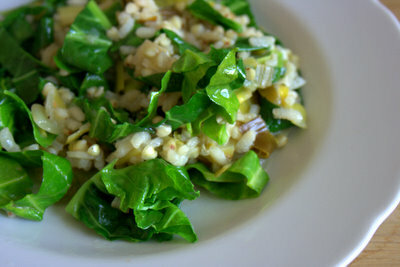 Vary your grains in this easy to make buckwheat and rice risotto, packed with spring greens and leek. Both naturally gluten free and vegan. 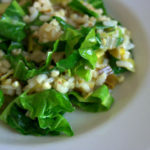 This recipe was a happy accident, I had been planning to make a risotto with my food co-op leek and some spring greens, but I only had half the amount of risotto rice I needed. I often cook a mix of rice with quinoa and buckwheat to serve in place of plain rice, so I decided to experiment with a risotto that was half rice and half buckwheat. The result was delicious and will be repeated. Many risottos are very rich and packed full of butter and cheese, this is light and very low in fat, slow cooking in stock makes the finished risotto creamy in texture. I added the stock in two goes and left the risotto to do its stuff over a low heat. If you so desire you can stand over it stirring all the time, but my neglected risotto seemed not to come to any harm. Despite its name buckwheat is not actually a wheat and is a distant cousin of rhubarb. It is high in protein and is rich in iron, zinc and selenium. Its grains are also a similar size to risotto rice, it takes about the same time to cook and is considerably cheaper. All in all this makes it a good thing, and a useful ingredient that I use often. Once again this recipe is very adaptable, I imagine that shredded cabbage, purple sprouting broccoli or asparagus would all be delicious instead of or in addition to the spring greens. If you try this Buckwheat and Rice Risotto with Spring Greens and Leek please tag #FussFreeFlavours on Instagram or Twitter. It is amazing for me when for me when you make one of my recipes and I really do love to see them. You can also share it on my Facebook page. Please pin this recipe to Pinterest too! Thanks for reading Fuss Free Flavours! Fry the onion, garlic and leek with some seasoning in a of splash olive oil for about 5 minutes until soft and translucent, stirring the whole time. Add the rice and buckwheat and carry on cooking for another few minutes; the rice will start to turn translucent. Add about a quarter of the stock and stir, add some more stock and the wine or vermouth, cover, turn the heat right down and leave for 5 to 10 mins. Return to your risotto, stir and add the rest of the stock. Leave for a further 5 minutes. If all the stock has been absorbed add a splash of water and give it a good stir; as the rice and buckwheat cook they will release starch which will make a creamy sauce. Keep adding more water as needed. Once the rice is cooked, but still with some bite, add the greens and cook for a further two minutes. Give one final stir and serve immediately.